Outside of Edinburgh and Glasgow, Manchester is probably my most-visited area. Not the city perhaps, but I’ve been finding myself in nearby Cheshire almost monthly. It’s a lovely spot, so whenever I get the chance to visit, I jump, and I’m always on the lookout for a great place to stay. 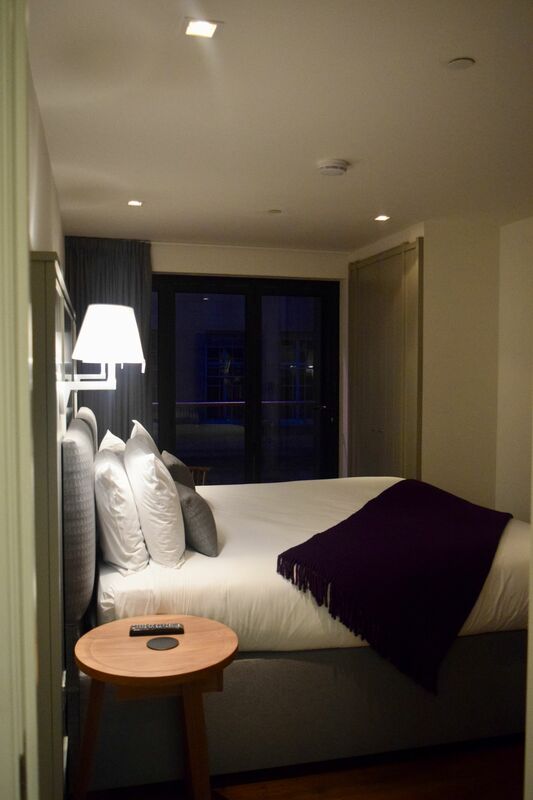 Last week, we made a weekend of the drive, and booked into Hotel Indigo Manchester – Victoria Station, one of the city’s newest hotels, and I’m glad to say, we were not disappointed! 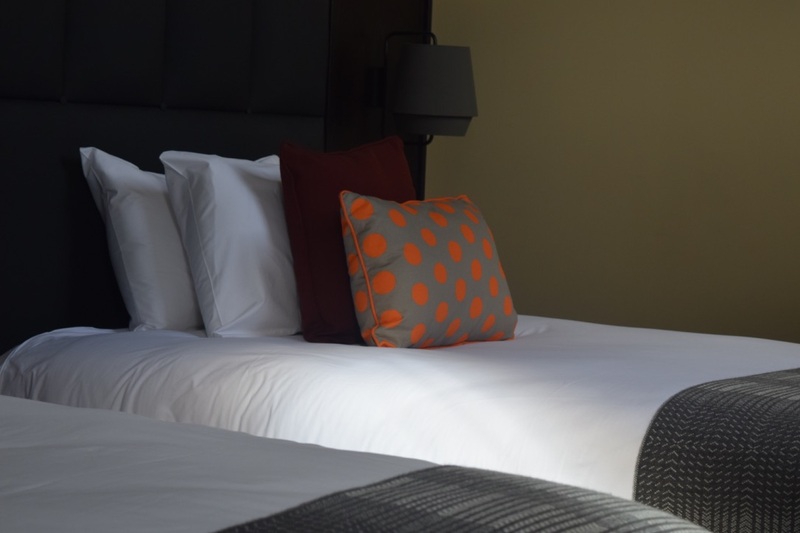 Located in the very heart of the city, and literally only steps from the Victoria train station, the building used to be a tea office, with a modern addition tacked on, and if you’re looking for a centrally located hotel in Manchester, this is the one for you! 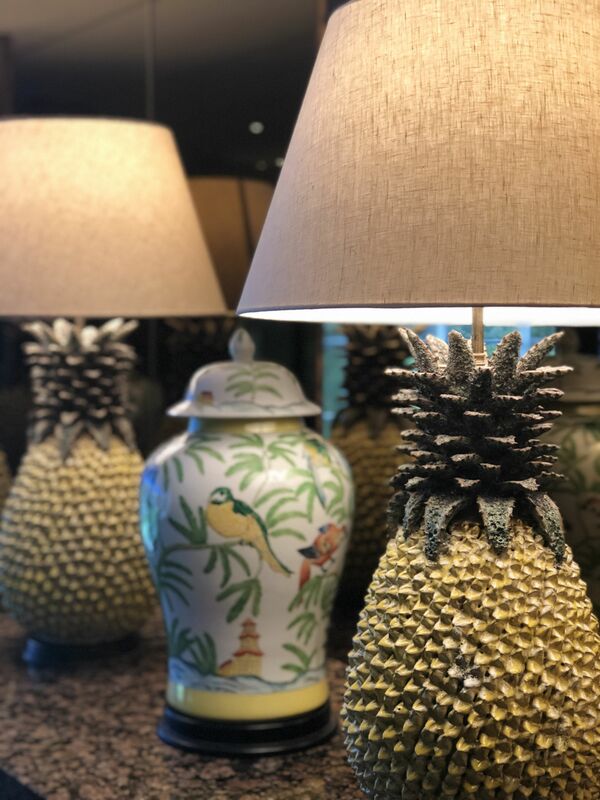 The rooms reflect the history of the building, and ours, a King, was located in the original building, and previously a tea office – hence the adorable Alice in Wonderland-esque decorations. Hotel Indigo Manchester only opened a few months back, and as a result the hotel still feels wonderfully crisp and new. 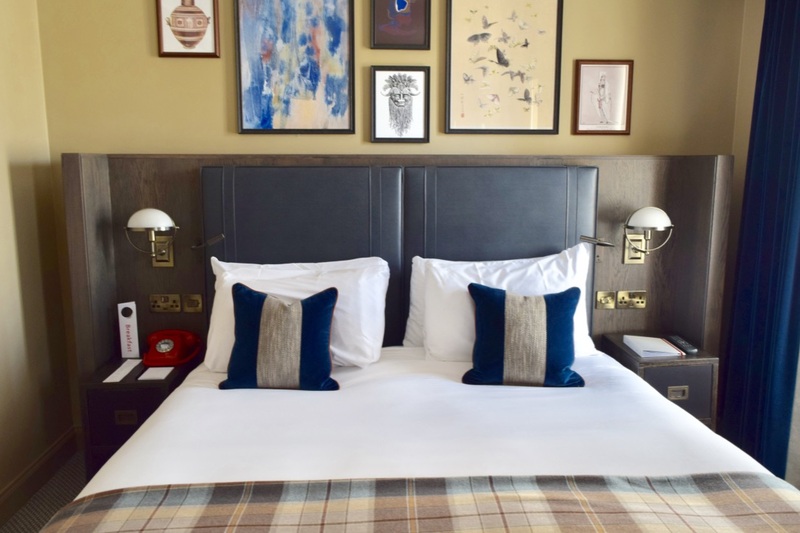 Since we had been driving for hours to get down to Manchester (with a quick stop-off in Prestbury to see friends) the room was a welcome treat. 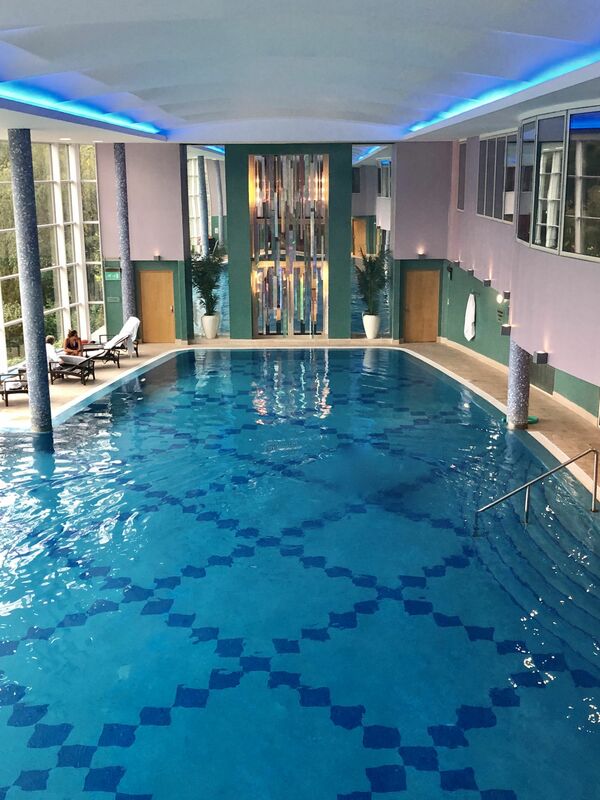 The only downside was that we couldn’t use all the facilities – there is a 24 hour gym, a gorgeous restaurant (Mamucium) and there is even an on-site coffee shop which we managed to head to for breakfast the next morning. 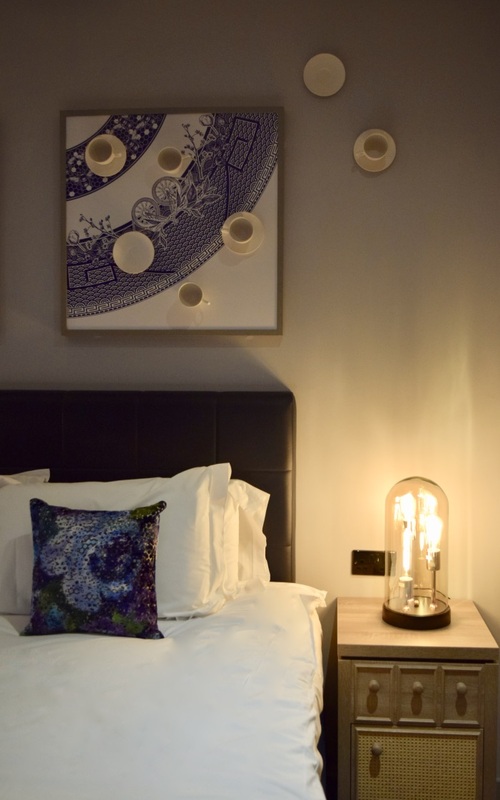 The design of the whole hotel, much like many of the new Hotel Indigo properties (you can read my thoughts on the beautiful Dundee property here) has been so well thought out. I loved the deep velvet and touches of marble in the room, but perhaps my favourite part was the bathroom. With a rainfall shower decorated with the most adorable delft tiles, it was an absolutely glorious spot to wash away grime of travel. 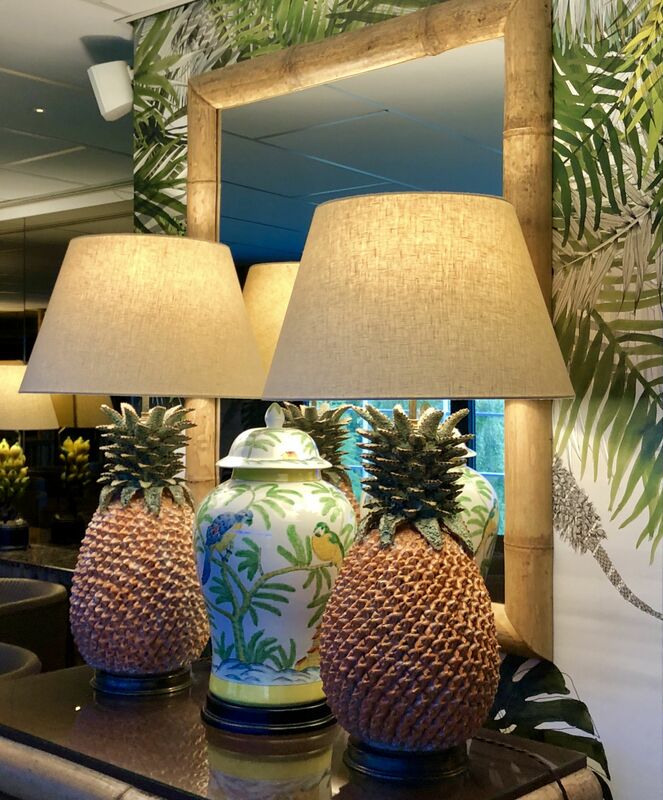 It was such a fun change from the usual white and marble bathrooms hotels tend to go for! 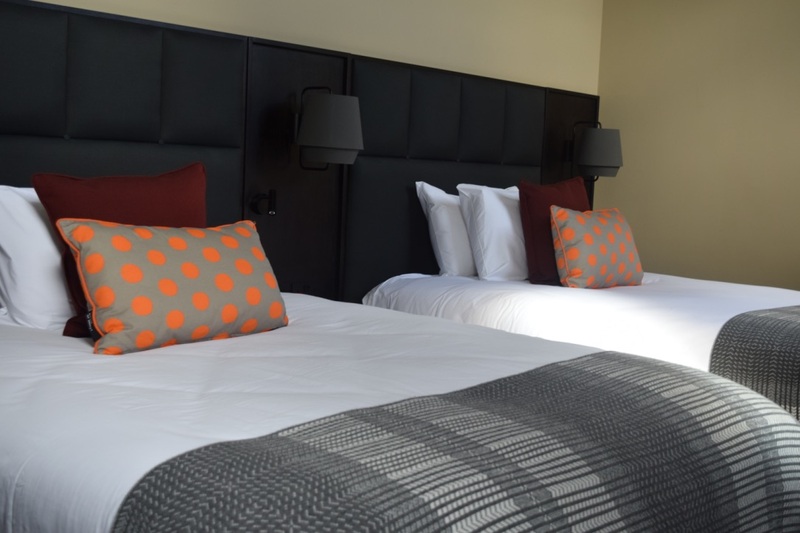 Perhaps the only downside to the hotel is the lack of on-site parking, but Hotel Indigo do have a relationship with the NCP carparks nearby and offer reduced rates. Since it was dark, I managed to miss a turn, and ended up somewhere in the middle of the town, but head to the Arena carpark and you shouldn’t go wrong! It’s fair to say that Dundee is having a bit of a moment just now. The V&A opened in September of last year, and pretty much every major travel magazine has named the city as a ‘can’t miss’ destination, thanks everything that’s going on. 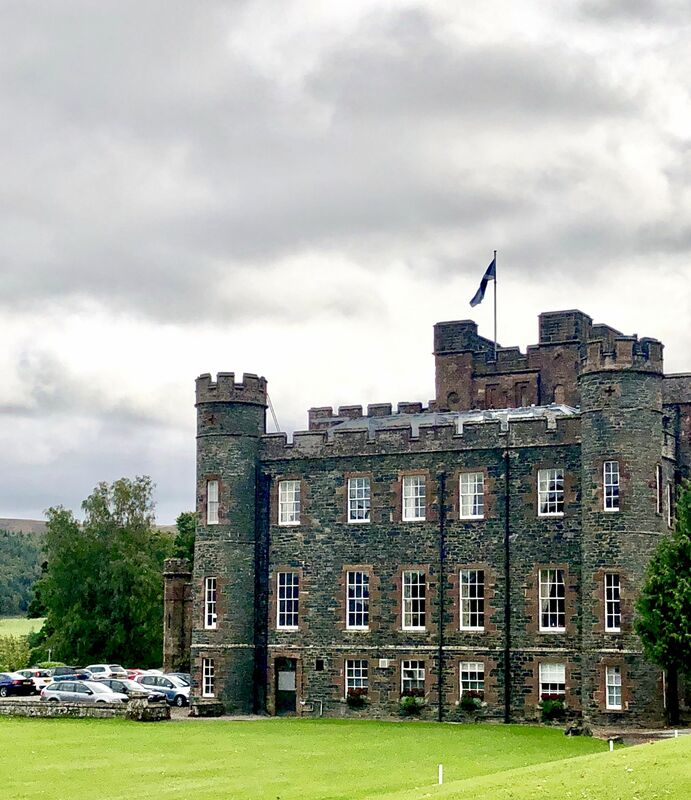 There are a surprising amount of galleries, both traditional and modern, and the city is small enough to walk around in a day or two, so it’s great for a weekend break into the bargain. 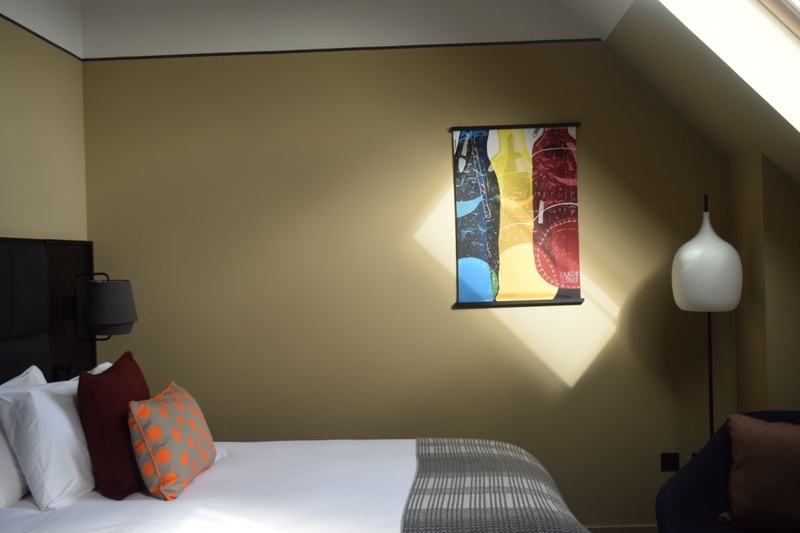 If you’re heading through to Dundee, which, incidentally, is Scotland’s sunniest city, the place to stay has to be the brand new Hotel Indigo Dundee. 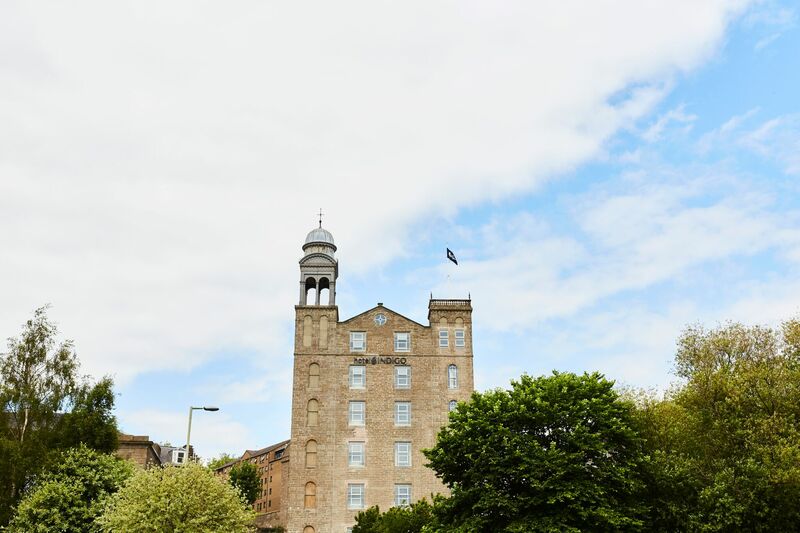 Opened in the city over the summer, and the result of a three-year, multimillion pound renovation, Hotel Indigo Dundee is a former linen mill, and it feels like no other hotel I’ve stayed in in Scotland. 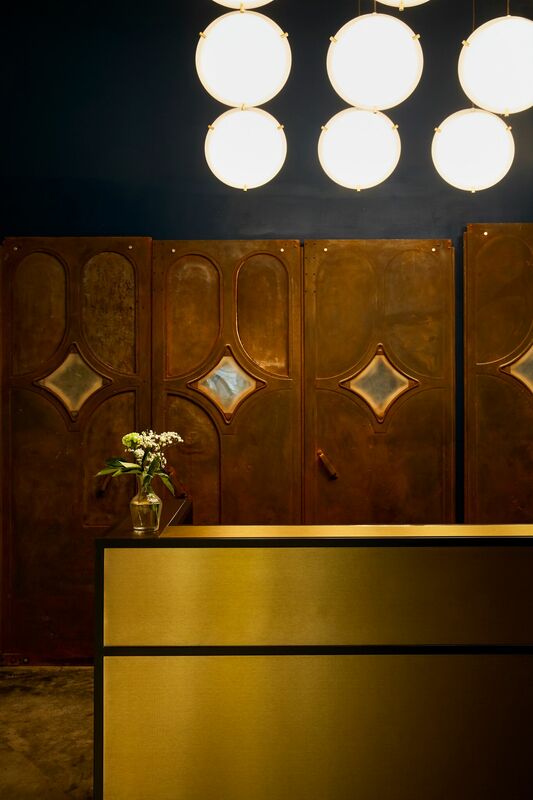 Taking cues from the hotel’s industrial past, the lobby is filled with relics from Dundee’s past. Think video games, mills and marmalade – it’s been laid out so it’s a great place to take a laptop and set up shop for a few hours, and you can even order food and drink there if you get peckish! 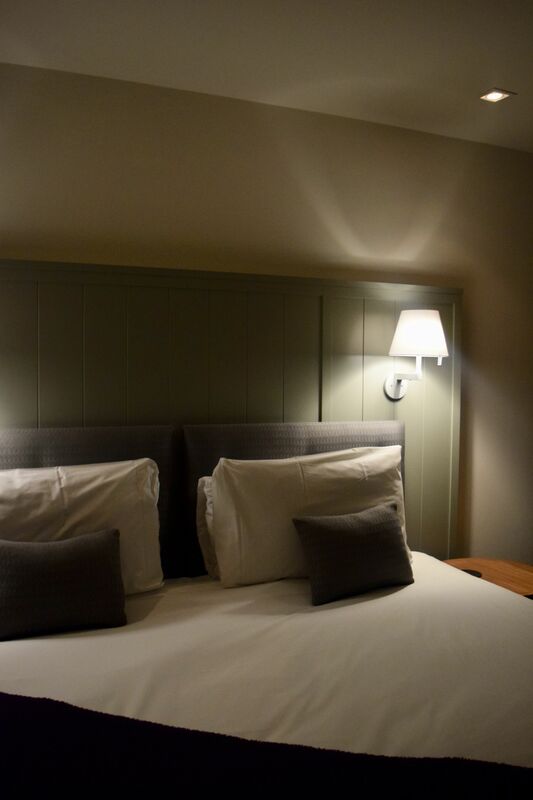 Thanks to the building’s linen mill past, the rooms are chock-full of character. 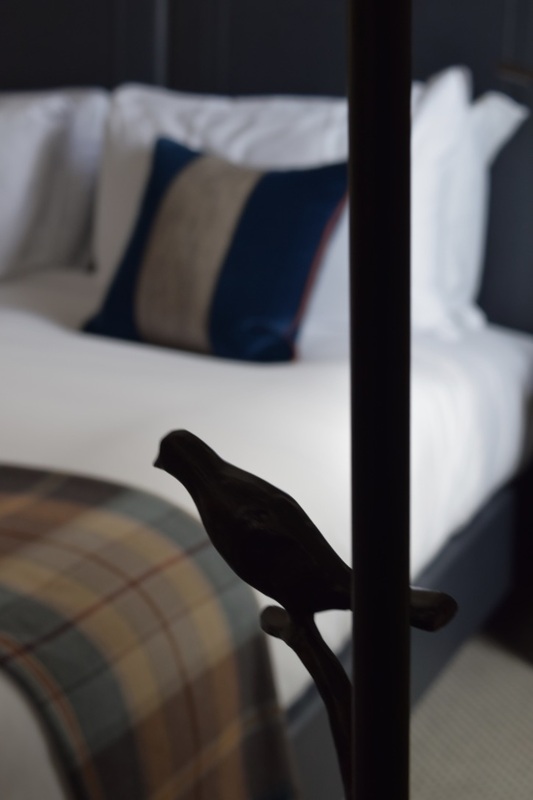 Some rooms have original brick ceilings, whilst others have iron beams and stunning views overlooking the Tay River. 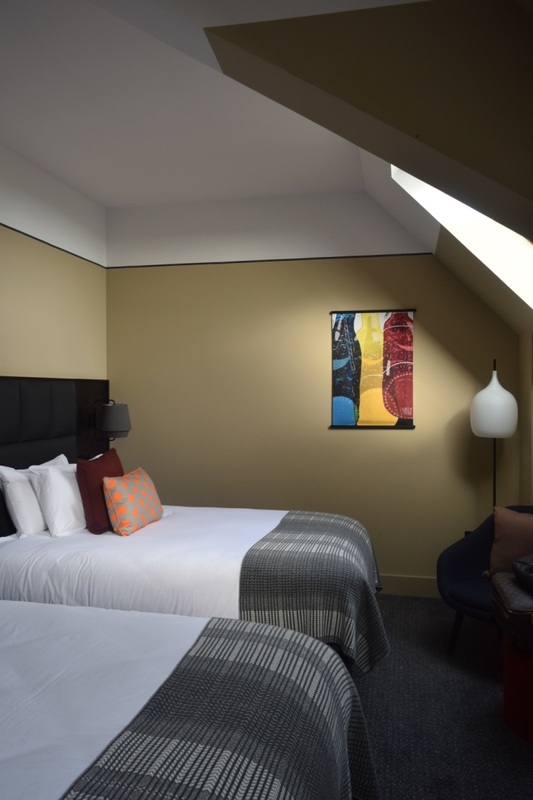 Our room was up on the top-floor, and came flooded with light thanks to the velar windows. It was the perfect spot to get some work done too, thanks to the huge desks, and I am obsessed with the Dundee-themed decorations. 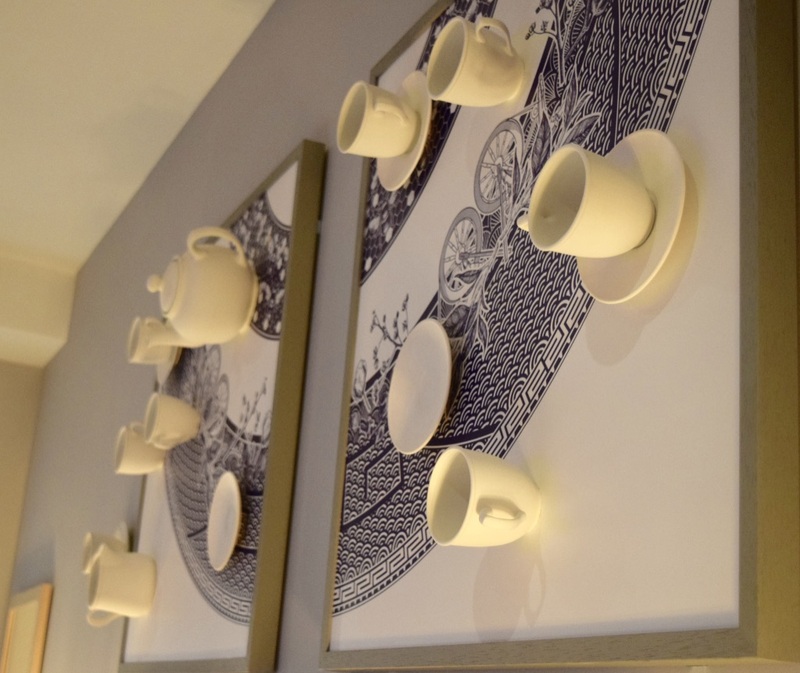 The artwork on the walls payed homage to local drinks legend Bon Accord, whilst the blankets come courtesy of locally-trained artist Hillary Grant. 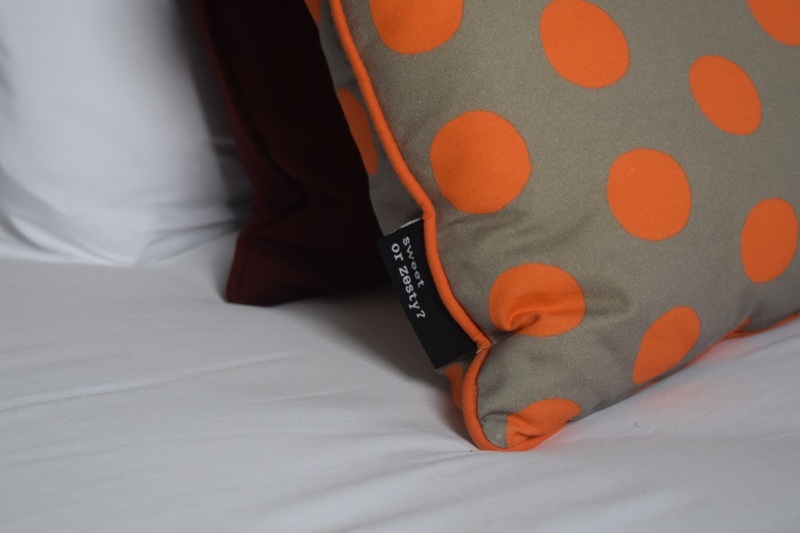 The cushions are also specially-made, and are all about marmalade. They’re also adorable! 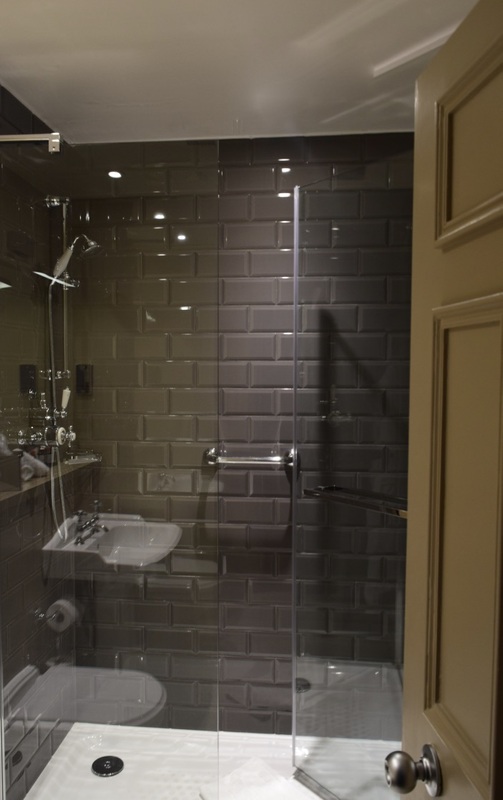 The bathrooms are also absolutely stunning – the showers all come with a fun marmalade decal, and the bathrooms come stocked with Arran Sense of Scotland goodies. They smelled absolutely divine, and when paired with the rainfall showers – it was a heavenly experience! After a heavenly night’s sleep in their Hypnos beds (which were unbelievably comfy!) we were more than ready for breakfast in the stunning Daisy Tasker restaurant. 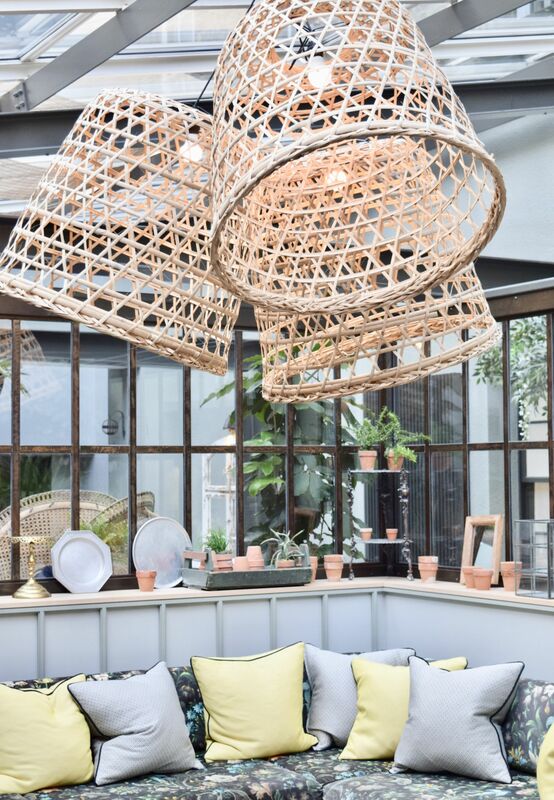 Named after a former mill-worker, who organised socials for the mill, the restaurant is an absolutely stunning spot, which has the most perfect industrial-chic vibes. It’s also been awarded 2 AA Rosettes – so you know it’s great! 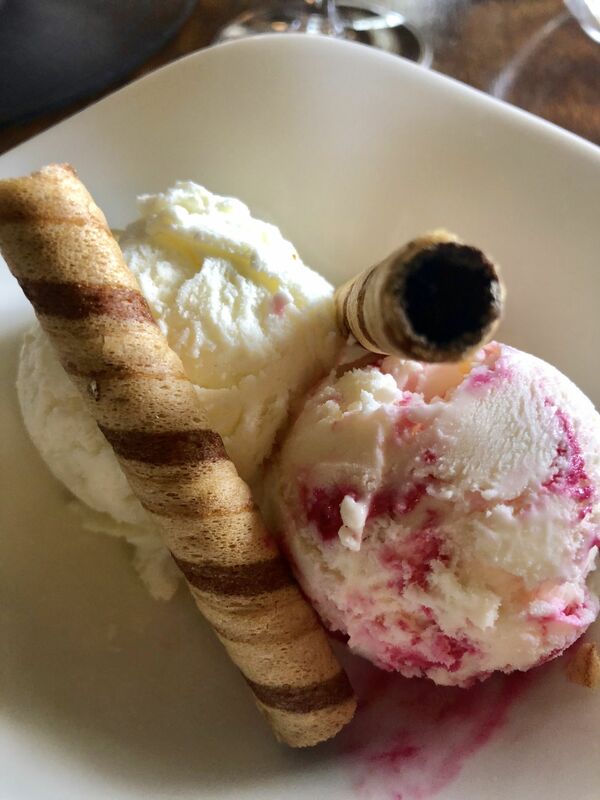 You can choose from a seriously generous buffet, and/or a hot menu. 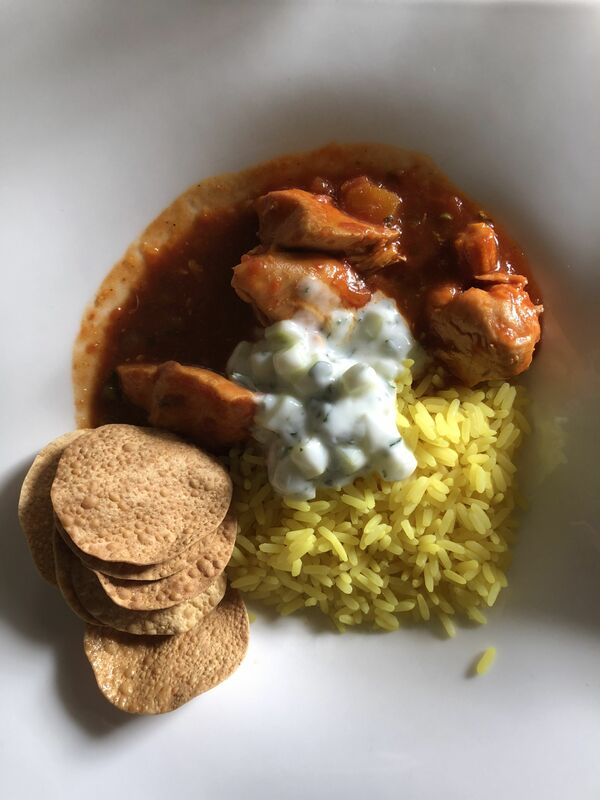 Since I’m not the biggest breakfast fan, I stuck to yoghurt and seeds, but I saw quite a few hot dishes which looked and smelled absolutely sublime! The past few months feel like they’ve been a bit of a whirlwind. Work has been super busy, and it’s meant I’ve not been able to find the time to pack up and head off somewhere sunny. Instead, I’ve taken a few weekends here and there to sit back, switch off and enjoy a little down time. 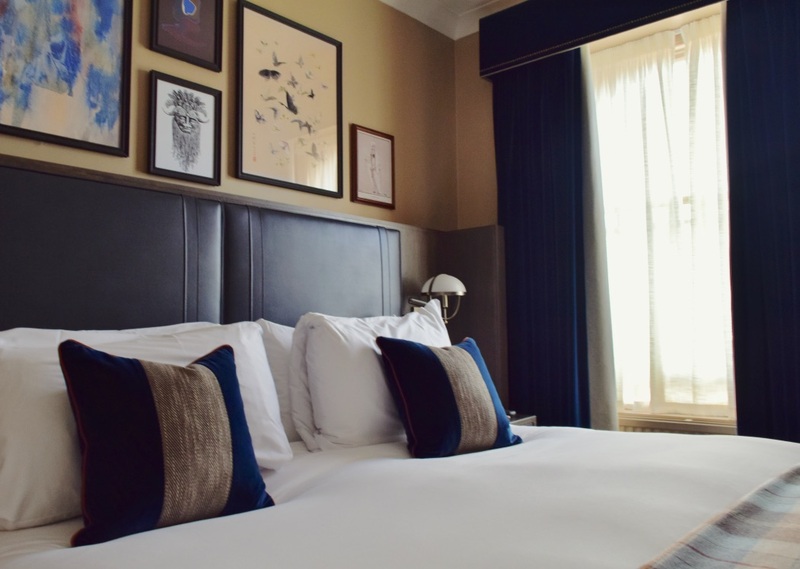 We enjoyed one of these weekends a few weeks back, when we headed to Edinburgh’s Principal Charlotte Square – a stunning hotel situated right in the heart of capital – with rooms looking out onto Charlotte Square and George Square. The hotel has a beautiful old-world traveller theme. 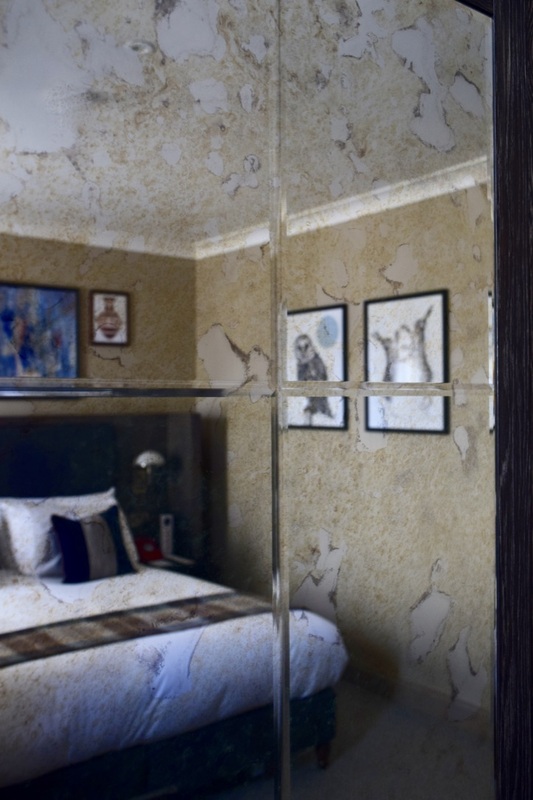 The entrance-way has been decorated with hats and suitcases, and rooms have an eclectic, collectors feel. The result is wonderful base for a trip to Edinburgh. Our room looked out onto George Street, and I can have sat people watching all afternoon! 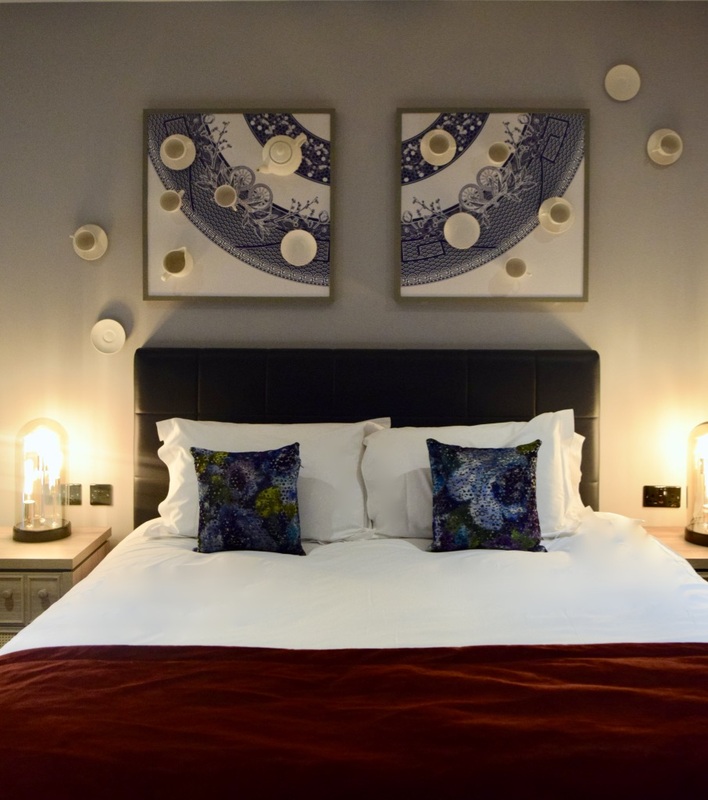 Like all Principal hotels, Edinburgh Charlotte Square includes more amenities than the average hotel room. 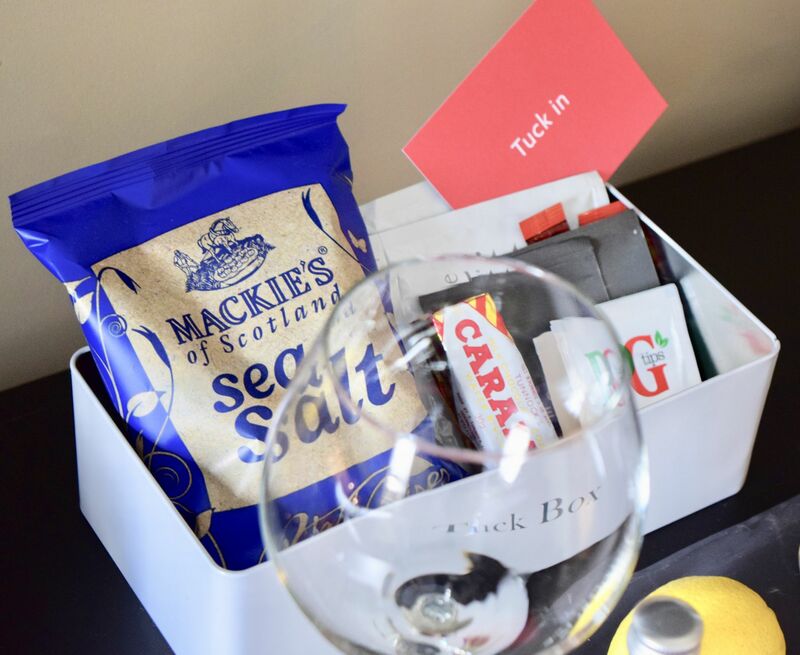 Instead of a pricey mini bar, there is a handy Tuck Box filled with coffee, tea and a few naughty snacks. 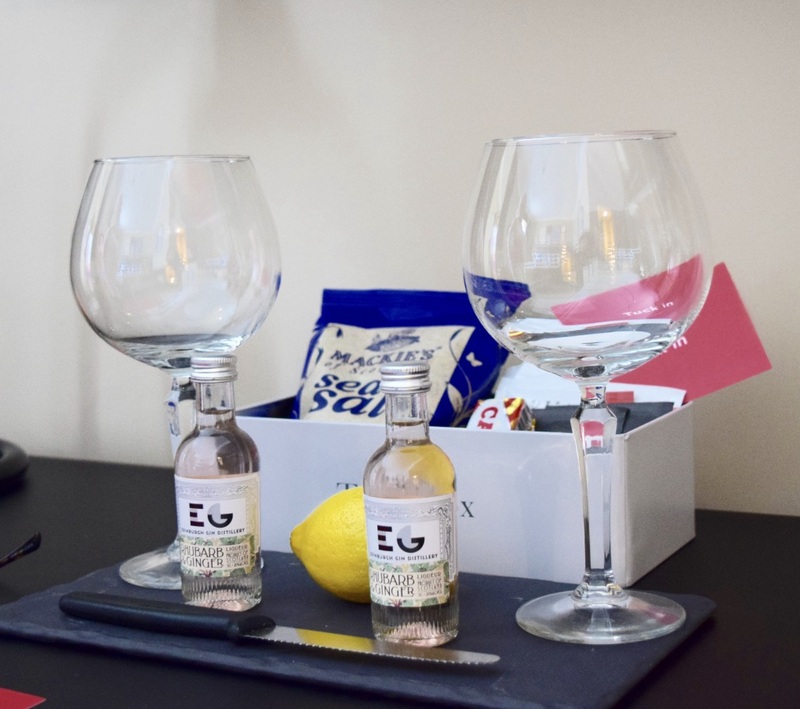 We were also treated to a fabulous G&T thanks to Edinburgh Gin, and downstairs in the lobby, you can purchase any essentials you might have forgotten, including decently priced prosecco, wines and beer. 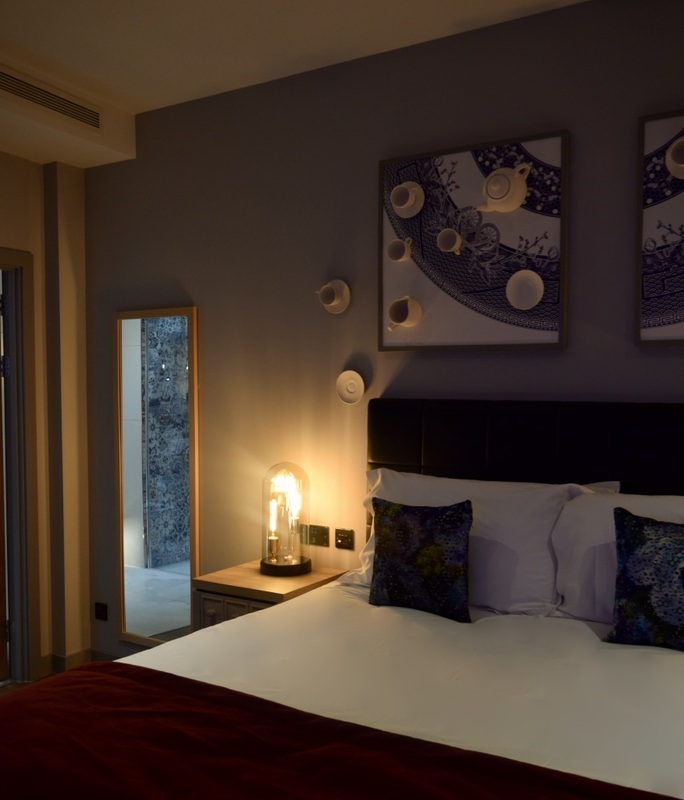 Thanks to being in the original Georgian part of the hotel, our room benefitted from huge windows, high ceilings and serious soundproofing. 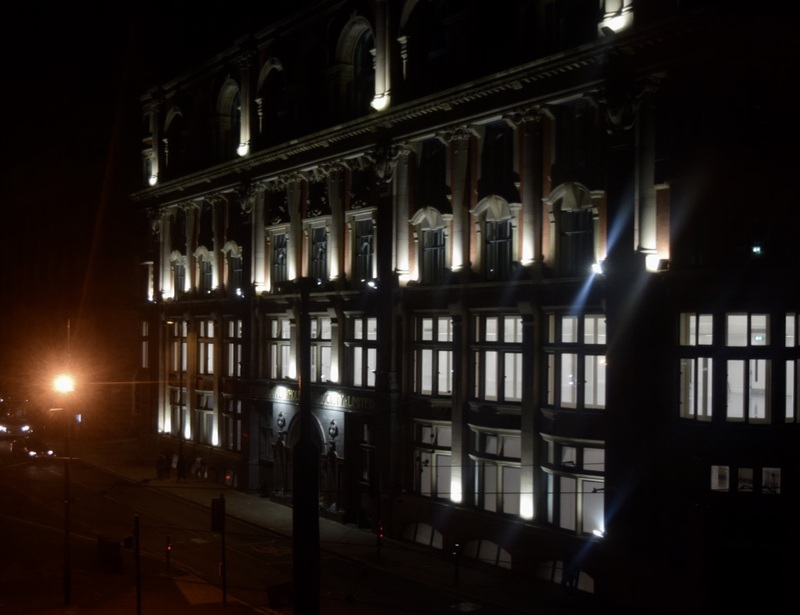 Despite it being a Saturday night, there wasn’t a peep from inside the hotel, with just a buzz from the revellers from George Street (we did have the windows open) it was such a cosy spot to spend the evening. 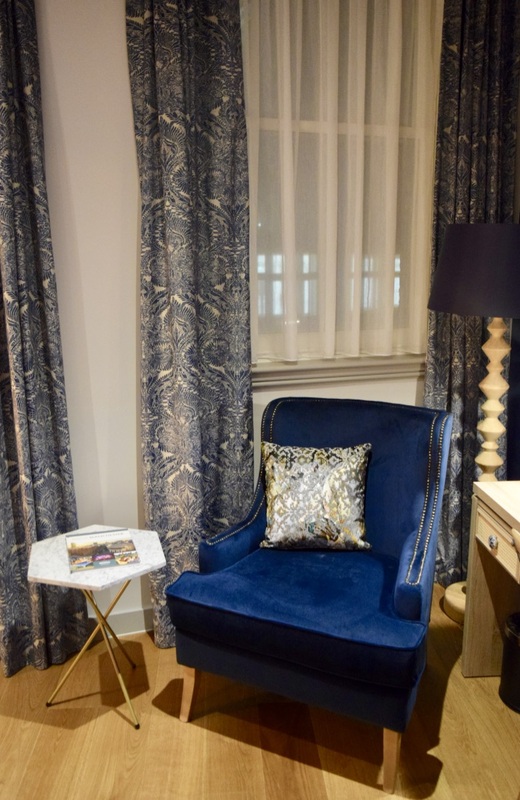 I’ve been lucky enough to stay at a few Principal hotels now, and Edinburgh’s Charlotte Square had to be one of the most stylish. With slick charcoal tiling, and a rainfall shower, it was an absolute joy. 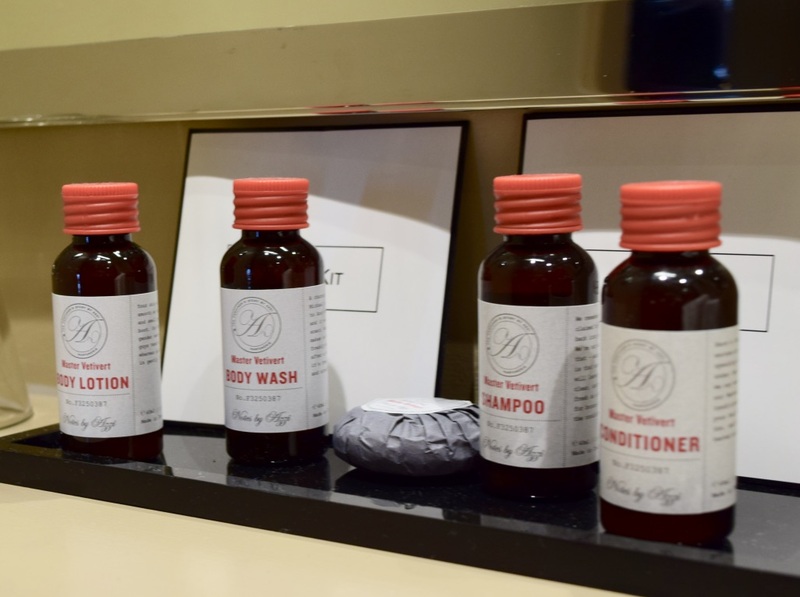 The bathroom was also well stocked with goodies from British perfumer Azzi Glasser. A few of years back, I was lucky enough to meet Azzi (here) and hear all about how she creates such gorgeous perfumes, so it’s so lovely to see an artisan British brand be promoted throughout a whole line of hotels. Thanks to the room being so comfy, we abandoned our plans for a night out in favour of room service and a couple of movies. It was exactly what was needed – I turned off my emails for the night and just enjoyed the moment. After a heavenly night’s sleep, we headed downstairs to enjoy breakfast. 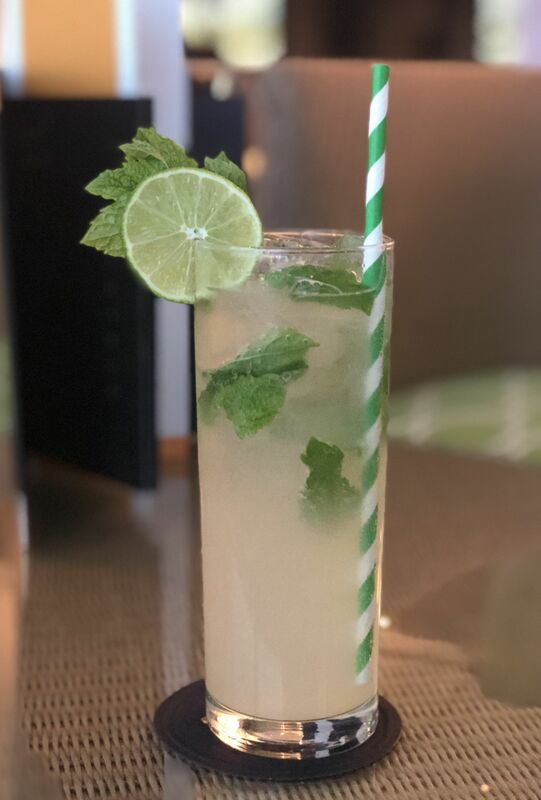 Normally this is served in the very insta-friendly Garden – a beautifully airy set up right in the centre of the lobby. Unfortunately, we didn’t get to explore, as since we were visiting during the weekend, and it was packed, so we were shown through to in-house restaurant Baba to enjoy ours. Principal breakfasts are varied affairs. 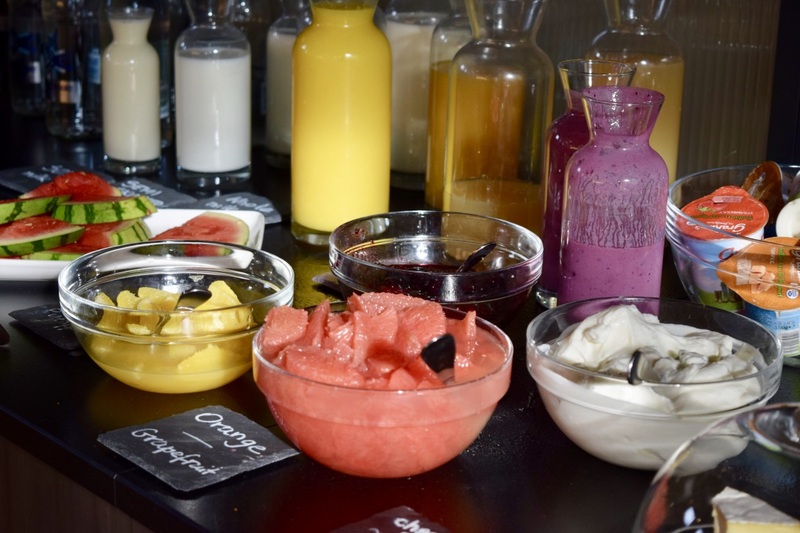 There is a tonne of fruit, pastries and a whole host of other niceties which you can pick and choose from, and there’s also a hot menu filled wth breakfast favourites. Since there was a wait for hot items, we tucked into grapefruit and yoghurt to start. 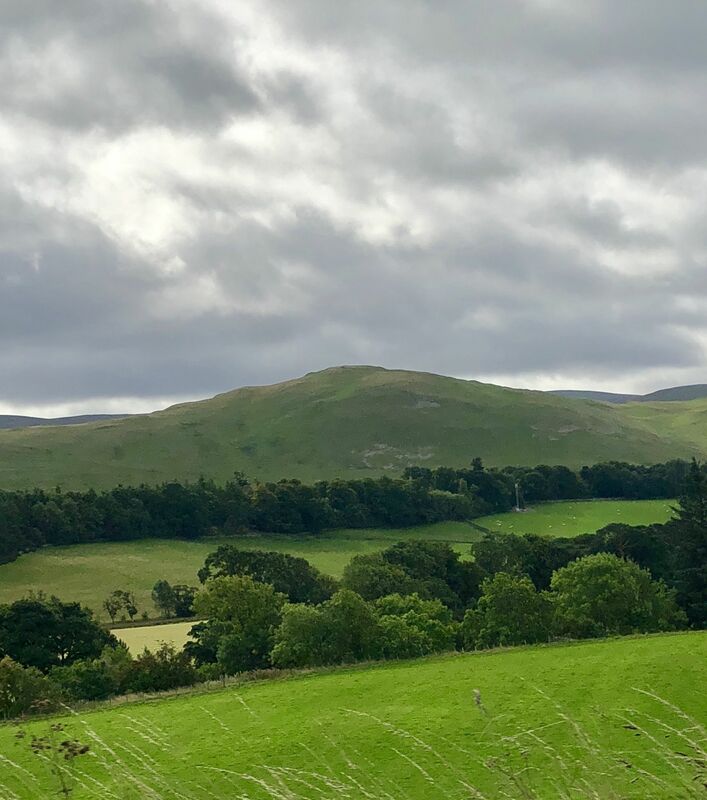 When then ordered up a cooked Scottish breakfast, it was everything you’d hope for, with a generous serving of bacon, sausage, eggs, beans and mushrooms. It was the perfect note to end the stay on, and I’m sure we’ll be back! Thanks so much to the Principal Charlotte Square for having us!